Undermount bathroom sinks are becoming popular for new bathrooms and bathroom upgrade projects. They look very sleek once installed and are easy to clean since the countertop overlaps the sink by a small amount. Undermount sinks rarely have holes for faucets which gives you flexibility to choose the type of faucet you want. Below are reviews of our favorite bathroom sinks you may find of interest. 2.1 How to Choose the Best Undermount Sink? 2.2 How to Install an Undermount Sink on Granite? It is so difficult to know which bathroom sink will fit the best in your bathroom. With an undermount sink, you have many options available and any one of them will transform your bathroom into a beautiful sleek paradise. These reviews will give you some ideas on types of undermount sinks available. This is a beautiful rectangular basin from Kohler with vertical sides. Undermount installation allows this sink to integrate seamlessly your cabinet or countertop. There are no faucet holes in this sink therefore it requires a wall-mount or counter-mount faucet installation. Kohler makes this sink from vitreous china for durable construction which is resistant to scratches and abrasions. The sink has a hidden overflow drain at the front of the sink leaving the basin lines smooth and unmarred. This sink pairs perfectly with Kohler’s Solid/Expressions vanity tops which will save you installation time and cost to complete your bathroom vanity and sink ensemble. The 1-year limited warranty makes this sink a risk-free choice for your bathroom upgrade project. This is an elegant oval undermount sink from Nantucket Sinks. 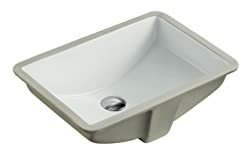 Its compact size makes it an ideal sink for small spaces. The sink is crafted from vitreous china which is resistant to scratches. 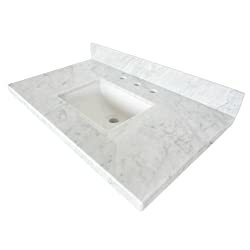 Designed to undermount to solid surface counters, this sink will complement any bathroom decor. The drain in this sink is 1.75-inches in diameter and the overflow drain adds security against potential flooding. Nantucket Sinks warrants the quality of its ceramic sinks to be free of any manufacturing defects. This warranty gives you confidence that this sink will be a risk-free selection for your bathroom. This rectangular-shaped ceramic vanity from Nantucket Sinks will add a sleek modern appearance to your bathroom. It has a standard 1.75-inch drain diameter and an overflow drain for protection from flooding. The sink is made of vitreous china with a porcelain enamel glaze. It is constructed for smaller spaces and has rough interior dimensions of 16-inches by 11-inches. Since it is an undermount sink, there are no faucet holes. You will need to install a wall-mount or counter-mount faucet to go with this sink. Nantucket Sinks offers a limited warranty on this product. This is a classic rectangle sink with an easy-to-clean polished surface. Made of vitreous china, the sink blends in seamlessly in an undermount installation with a 24-inch minimum cabinet size. It has a standard 1.75-inch drain diameter which works well with pull-up and pop-up drains. The overflow drain at the front of the sink protects you for unexpected water flowing out of the sink. The sink has large interior dimensions of 19.5-inches by 13.25-inches. It has an impressive depth of 7.5-inches. If you are looking for a sleek sink to give your bathroom a modern upgrade, look no further. This KINGSMAN sink will complement your bathroom decor and blend in smoothly with all other fixtures. This is a classic rectangle undermount sink with a well-sloped bottom allowing water to drain completely. The vitreous china provides an easy-to-clean polished scratch-resistant surface. This sink fits seamlessly as an undermount sink and blends in nicely with any countertop setting. 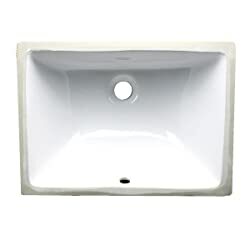 The sink has a standard 1.75-inch drain diameter opening and works with either pop-up or pull-up drains. As with most sinks, there is an overflow drain trimmed with a chrome ring to prevent water from spilling out onto the floor. If you are tired of sinks that do not have a steep enough slope towards the drain, then consider this sink from Contempo Living. You will never have to mess with water pooling around the sink drain again! 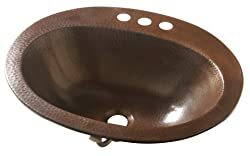 Are you looking for an elegant aged copper sink to match other fixtures in your bathroom? This beautiful drop-in sink from Sinkology might be the perfect match! This sink is individually handcrafted with 18-gauge pure solid copper. It features 4-inch faucet holes and an overflow drain. The sink is a drop-in sink that can be secured to the countertop with silicone. As with any copper fixture, you must follow the care instructions to make sure the copper finish keeps its aged appearance. Any harsh chemicals that are used may strip some finish away leaving you with a bright shiny copper instead of the original aged copper. 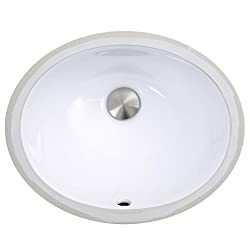 This is a beautiful oval basin with an unglazed underside to give your bathroom that fresh sleek appearance. The sink features an overflow drain and uses a clamp assembly for installation. This Kohler Caxton sink fits into a standard 14-inch by 17-inch countertop cutout saving you time and money. The vitreous china material gives this sink long-lasting gloss and durability. This sink will fit seamlessly into your bathroom decor and will give your bathroom the spa-like environment you’ve been waiting for! This is a sleek hammered nickel oval bathroom sink from Sinkology. It has a beautiful hammered nickel finish that is simple to care for and will transform your everyday bathroom into a spa-like experience. The maintenance-free finish can be cleaned with simple soap and water. It is a drop-in sink with 3 holes for the faucet and an overflow drain. This luxurious state-of-the-art sink will make the bathroom your favorite room in the house! Sinkology offers this high-quality copper sink with a hammered nickel finish. It features a dual-flex rim design giving you flexibility and easy installation. The maintenance-free finish will give you a sigh of relief. Cleaning this sink is a breeze with soap and water. Although this sink does not have an overflow drain. The design of this sink makes it possible for it to even be mounted as a vessel sink above the countertop! This gives you multiple installation options to consider. Sinkology offers a limited lifetime warranty on this sink. This is an incredible solid marble vanity top and integrated sink from Kingston Brass. It can be installed on a 36-inch vanity cabinet. It includes a 4-inch integrated backsplash and is extremely easy to clean. The top of the countertop and sink combination includes 3 pre-drilled holes for a widespread 8-inch faucet application. This beautiful marble countertop and sink will elevate your bathroom space to a royal status. If you are looking for a fully integrated sink and countertop solution, this Kingston Brass product may be the right choice for you! Before you buy an undermount sink, you should understand the features that should be considered. You may also want to know how undermount sinks are installed. We have provided for you some answers to these questions. How to Choose the Best Undermount Sink? When searching for an undermount sink, you need to know what size and shape you need for your bathroom. If you have a small bathroom, you want to steer clear of larger oval or rectangular-shaped sinks. These will make your bathroom appear even smaller and will take up some precious space your bathroom has to offer. The other feature you should consider is the reveal of the sink. The reveal represents the amount of the sink rim that sticks out of the vanity top where the sink is installed. Some undermount sinks are rimless and do not have a reveal at all. Others have a thin reveal in which a small amount of rim can be seen on the counter. Consider what style you prefer for your bathroom project. How to Install an Undermount Sink on Granite? If you are installing an undermount sink on granite, you may have your work cut out for you. I highly recommend you hire a professional to cut the sink cutout in your granite countertop. This is not an easy task and professionals have experience cutting the properly sized sink cutouts. Have the professional cut the hole in the granite where you will insert the sink. Insert the undermount sink into the hole in the granite. As long as the cutout is the correct size, the sink will sit below the countertop. With the sink in place, measure and mark the positions where you will need to drill holes for the screws and wing nuts. Remove the sink and drill holes where you marked the spots. Clean the ridge of the sink with denatured alcohol. After you have allowed the sink to dry, apply a thin strip of silicone sealant to the edge of the sink. Place the sink in from underneath and center it into position under the granite. Next, clamp the sink in place. You can do this by placing a 2×4 across the sink and clamp the sink to the 2×4. Insert the wing nuts into the screw heads and tighten them with your hands. Finally, after the sink has cured and set for a few days, you can install the fittings for your faucet. Shut off the water supply valves and disconnect the supply lines and drain. Check for small metal clips on the underside of the sink. If these are present, insert the edge of a putty knife beneath the clips and break the clips away. Remove the silicone sealant by inserting the edge of a utility knife on the underside of the counter where it meets the sink’s rim. Slice through the caulk slowly. Be sure to hold the sink in place so it does not fall! You may need to get help for this step. Continue to slice through the caulk or sealant until the sink is free from the countertop. Once the old sink has been removed, you can follow the steps above to install your new undermount sink. You now have all the information you need to make an informed decision on buying an undermount sink. Remember to consider the size and shape of the sink and how it will fit into your bathroom. Once you have selected your ideal sink, you can follow all the steps we’ve provided to install your new sink and give your bathroom a brand new look.